When you are popping the yogurt jars in the maker, should they make an actual popping sound? I hope this isn't a too silly of a question but does this mean if I want to make Coconut Milk Yogurt I could theoretically use Soy Yogurt as a starter? Do the same bacteria colonize both types of yogurts? Perhaps it's the same bacteria in dairy and non dairy yogurts... I'm not sure. You should be able to use any yogurt as a starter as long as it has "live cultures." 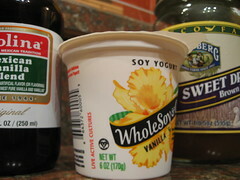 The term "live cultures" refers to certain bacteria, and these types of bacteria are used in all yogurts. 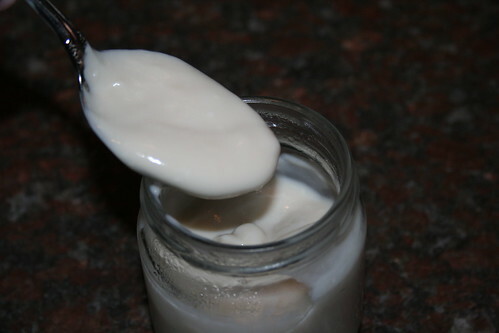 The bacteria eat sugar and produce lactic acid as a byproduct, which gives the yogurt its tart flavor. 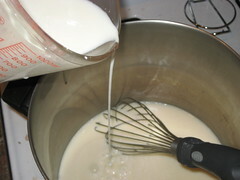 As you can see from the recipe, I use a combination of coconut milk and soy milk to make my yogurt. I've never tried to make yogurt from only coconut milk, but it should work on the same principle: put the live cultures into the milk, along with some sugar. Where I live, there is coconut yogurt you can buy at the store. Check out the packaging and make sure it has "live cultures" in it. If it does, it should work as a starter, which would enable you to have coconut yogurt with no soy. I hope this is helpful. Feel free to ask any other questions. Sorry if this is a little incoherent; there was just an attempted political assassination where I live and I am upset. But yes, you could use soy yogurt as a starter for coconut yogurt. You should also be able to use coconut yogurt as a starter. As long as the starter you use contains "live cultures" it should work, because they are the same bacteria species. Anna, thanks so much when you've got such a terrible thing on your mind. I do hope things will get better. Yes, the bacterias in most of the yogurts look the same so I'm hoping I can do the straight coconut milk thing. I'll let you know. Have you tried to make tempe gembus? It's fermeting okara to make a tempeh. Veg Lab Rat: No, I haven't tried that, but I have heard of it. I should try to find a recipe, because it sounds pretty interesting. I remember years ago, when I started trying to make my own tofu, I would read here and there about ordering starter kits to make your own tempeh -- since I'm not a big fan of having to mail order my food, I never looked into it, but maybe this would be worth overcoming my aversion! 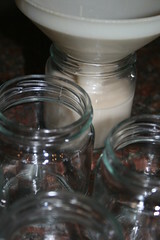 I tried making soy yogurt years ago and gave up after one try. Thanks for sharing! Thank you for sharing this recipe. I am going to try it this weekend. It looks like you may have the same yogurt maker as I do--Euro Cuisine, with the seven little glass jars. If you want to make a large bowl of yogurt as opposed to the (annoying) jars, try using the Pyrex 7 cup glass bowl. this is the best blog i have stumbled upon in a long time. you rule.